Shopping for Jay and Silent Bob Vinyl Figures? Vinimates, the Minimates-style vinyl figures based on pop-culture icons, makes its debut at Comic-Con, and who better to get Vinimated first than comic book icon Kevin Smith? 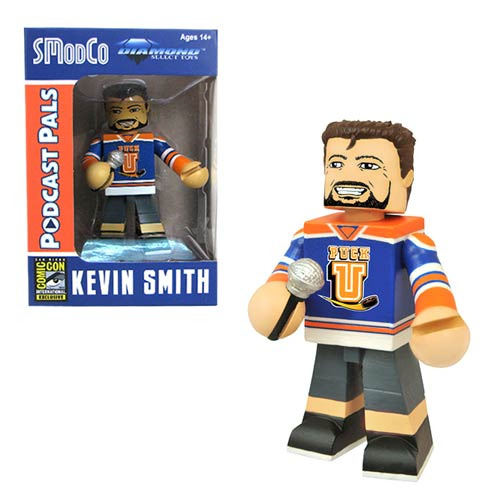 A comic writer, comic-shop owner and unabashed geek, Kevin Smith will be the first static, 4-inch Vinimate in the "Podcast Pals" series of Vinimates, featuring some of the biggest celebrities SmodCo has to offer. Holding a microphone and wearing his trademark "Puck U" hockey jersey, Kevin Smith comes packaged in a full-color window box. The Vinimates phenomenon starts here! Limited edition of only 2,000 pieces! NOTE: This item will first be sold at San Diego Comic-Con 2015. If supplies remain after the show, your order will be filled. Ages 14 and up.